There are many products on the market nowadays for the pet owner to help cut the stink of their animals’ waste and in the cages/bedding. This ranges from additives to the pet’s food/water to air purifiers to cleaners to beddings. In the last couple years, several companies have come out with many pet-safe products to use in and around animals. GoodBye Odor is made with natural plant-based amino acids that is added to a small pet’s food or water to prevent odors usually associated with pet excrement. Comes in Small Animal and Ferret versions. Made by Marshall Pet Products, the ferret experts. Kanberra Gel and Kanberra Spray are all-natural air purifier products (blend of oils that contain pharmaceutical grade tea tree oil and no chemicals so it is safe to use around pets) that cleans the air and surfaces, attacks mold and mildew, and neutralize odors. The gel comes in a container that you set out to absorb odors. The spray is used to spray in the air or on surfaces. Zero Odor spray is a patented formula that bonds with odor molecules in an irreversible reaction that’s powerful, yet odorless, non-toxic, and biodegradable. Spray it on tile, vinyl flooring, upholstery, pet beds, and other surfaces. Healthy Habitat™ by Natural Chemistry, uses natural enzymes and botanicals to eliminate pet odors, safe to use within any pet habitat. PureAyre® Odor Eliminator for all pets – a food-grade odor eliminator spray that uses powerful plant-derived enzymes that break apart the molecular bonds of odor-causing compounds to eliminate both odors and harmful contaminants. Made from plant-derived enzymes, purified water, and essential oils. Nature’s Miracle Products® – Cage Cleaner for Small Animals spray made with bio-enzymatic odor-locking technology to remove tough, caked-on debris and strong, embedded cage odors; won’t leave perfumes or strong scents that can irritate small animal respiratory systems. Small Animal Cage Scrubbing Wipes would be good to wipe down solid shelves everyday; has plant derived enzymatic odor control to eliminate tough cage odors. Cage Odor Eliminator for Small Animals is designed to be used in between cleanings to break down tough ammonia and other odors; Ed. Note: if the cage smells, it should be cleaned, sometimes cleaning the pee corners is all that is needed in between the weekly cleanings of the entire cage getting scrubbed down. Wipe Out by Zoo Med, is an antibacterial cleaner, disinfectant, and deodorizer for terrariums and small animal cages; kills Salmonella choleraesuis and Pseudomonas aeruginosa; not to be used in direct contact with bedding, animals, or other items in the cage. Kaytee® Clean Cage Habitat Deodorizer Spray – a non-toxic cage cleaner and deodorizer that contains a unique combination of environmentally-safe cleansing agents plus refreshing odor control properties to safely clean your pet’s home and accessories. You can also find many veterinarian-grade products to use for cage cleaning such as Nolvasan, Rescue® disinfectant concentrate by Virox Healthcare, and others (check the several sales sites for the different products). There are also beddings on the market with odor control built in. While they are supposed to be safe to use with our pets, some have such a strong odor from the additive, it makes it questionable to use and have the critters sleeping in it and breathing it 24 hours a day. Others are scented such as Kaytee® Clean & Cozy scents beddings (lavender, summer storm, Tahitian vanilla). Be careful with scented beddings as those can cause sneezing or other issues. Absorption Corp. has a new CareFresh® Litter Plus in small and large pellet sizes. This is a mix of CareFresh® bedding and low-dust pellets made from natural cellulose fiber. They also have a CareFresh® Custom Hamster & Gerbil Natural Paper Bedding with a proprietary Odor Stop formula to control odors for 10 days (they stopped adding baking soda as of January 20151). Some newer beddings with odor-control additives are Fibercore Eco-Bedding Odor Control – recycled crinkled paper strips with triple action odor control (doesn’t say what the odor control is); the regular version makes good nesting material; Vitakraft®Fresh World®Bedding in Multi-Pet Strength and Ultra Strength (super soft crumbles made from recycled paper) baking-soda-free formulas with up to 14 days odor control, and Hartz® Nodor® Natural Bedding for Small Animals – cellulose fiber with odor encapsulating technology. Hartz®also makes Nodor® Cage Wipes and Nodor® Bedding Spray like the Nature’s Miracle products. You can read critiques done in the past on some of these beddings. Adding 2 drops per 8 oz water of apple cider vinegar can help neutralize some of the waste odors. Added to the food (De-Odorase™) to help reduce waste odor. Also used to help reduce joint inflammation from its high numbers of saponins and polyphenolics (anti-inflammatory and anti-arthritic). Breeders in the past have added it to their rats’ water with positive results. This is the most common additive used, especially for people with male mice. It is usually added to the water but some have sprinkled it around the cage every 1–2 days. As a water additive, use 1–3 drops per full-size bottle. Some will alternate this mixture with plain water every few days to give a break. For rats, people have used anywhere from 1 drop/squirt to 1 tsp in each bottle, to 2 tsp./gal. (some also feed fresh parsley) with good results. Use baking soda under the bedding in no-contact situations (trays underneath the cage such as rabbit cages). Can be toxic if ingested in large quantities. Some beddings contain baking soda as an odor controller such as Hagen’s Living World Fresh ’N Comfy, Sunseed brand Fresh World Bedding (the Sunseed Fresh World Bedding Multi-Pet Formula and Vitakraft Fresh World Bedding does not have baking soda), Fresh News, and Petco brand SoPhresh. Sweet PDZ (horse stall refresher) and Healthy World Pet Deodorizer is made with zeolite for ammonia absorption and odor neutralization. Put this on the bottom of the cage with your preferred bedding on top. See the product review in the WSSF 2015 issue. This is a new odor-control product made out of select wheat bran, certified organic probiotic, blackstrap molasses, and purified water which makes it safe if eaten. It reduces ammonia concentration and captures odors without perfumes, chemicals, toxins, or masking agents. It is added to the fresh bedding of small animal cages with more added in between bedding changes as needed. An air purifier can not only reduce odors but also remove contaminants in the room. Get one that is high quality. Those that have a professional HEPA filter system like used in hospitals have the best performance level. Granulated active carbon is effective for the removal of many gaseous contaminants. Air fresheners that come in a container/bag made with active carbon and zeolite you put next to your critter cage will absorb the odors from the air. Zeolite also comes in rock chunks or in bags to place around outside your pet cages (marketed for use in homes, closet, kitchen, basement, car, boat, or gym locker; effectiveness is renewed by placing the bag in direct sunlight). Do not use aerosol air-fresheners or room deodorizers that spray out chemicals. Burning beeswax candles (not paraffin) in rooms can clean the air and help neutralize or prevent odors. Don’t use ones that just mask the smell and don’t use sprays in the air as this can be harmful to the lungs. Rock salt lamps when turned on attract pollutants which then clean the air. Needs to be near the animal cages. Opening a window and having a fan blowing the air from inside where the critters are to outside will help. 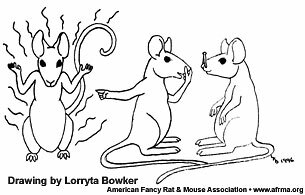 One breeder used this method along with an air purifier in her mouse room and visitors never knew she had mice in a spare room in the house. Humidity can also play a role in how fast the cages get dirty so keep the humidity to a normal level, using a humidifier if necessary. Male mice stink. Period. Some of this can be genetics and breeding to where some males stink more than others. The English show mice that I breed don’t have the super pungent odor that pet shop mice have. Some of these are so strong the smell can drive you out of the house. Males will mark their cage to get it to smell just like they like so when the cage is freshly cleaned, he must mark it all over again to get it smelling just right. Many people mistakenly think that they must clean the cage more often than normal, but in doing so it just makes the smell worse by the male having to constantly mark his area to his liking. Another thing is male mice will stink more when upset or moved. And don’t forget what’s in the cage (toys, house, wheel, etc.) gets marked and will contribute to the smell. These items must be replaced/cleaned on a regular basis when they get really stinky. Some people have found that adding some of the used bedding to the new bedding helps in reducing the marking. I use this method to be able to keep multiple males together for as long as possible without fighting. By just cleaning the pee corners, then adding fresh bedding with old bedding on top, the mice still have what smells like their old cage, and I’ve been able to keep non-breeding males together sometimes their entire lives. Of course when the whole cage needs cleaned, keep some of the old bedding to sprinkle on top. One breeder cleans the cage with heavily diluted bleach water then sprays with a vinegar/water mixture. Before adding bedding she puts a few drops of vanilla on a paper towel and rubs it on the cage floor. By doing these steps, the smell of her mice is reduced by 80%. Another breeder used ¼ tsp. vinegar and ¼ tsp. vanilla per 1 cup water (and only offered this mixture to drink) and used corn cob bedding under CareFresh® and found this worked best for their mice. And another found Sweet PDZ powder (zeolite; a horse stall refresher) sprinkled on the bottom of the cages underneath the regular bedding helped along with alfalfa (hay or pellets). I find the aspen pellets in the corners of the cage underneath aspen shavings works best for me in keeping the mouse cages from smelling. With breeders that have multiple male mice, keeping them in a separate climate-controlled shed/building is usually the best solution. So you can see there are multiple ways to help control odor whether it is something you add to the animal’s food/water, bed-ding/cage, or the room. When using new products, make sure you do your research. Some products that work for others may not work for you, so it may be trial and error to find something that works to your liking.